Regulations by some Muslim community leaders had banned gatherings by minority religious groups and the use of loudspeakers. They were issued days after members of the Indonesia Bethel Church had held a ceremony. For the local police chief, national values ​​of pluralism “are not negotiable". 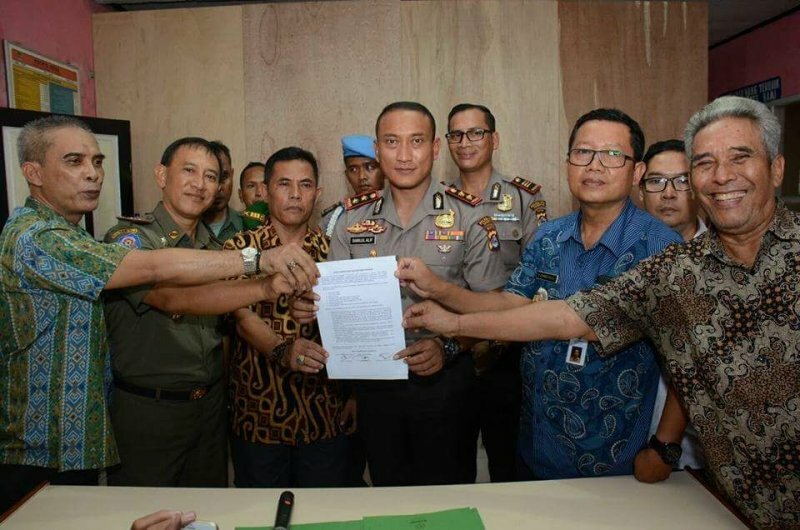 Tangerang (AsiaNews) – Local authorities in Tangerang, a regency (district) in Banten province, revoked a public notice issued by community leaders in Rajeg sub-district that would have severely limited the religious activities of non-Muslim residents. The decision was taken last Friday after days of criticism of the ban, seen as form of discrimination by the Muslim majority against fellow citizens from other religions. The regulations allowed non-Muslims living in the Bumi Anugerah Sejahtera residential area to use their homes as places of worship, but prohibited them from inviting outsiders, be they lay or religious. The use of loudspeakers during religious services had to be requested three days in advance. On the instructions of the Tenarang Regent, Ahmed Zaki Iskandar, the local police chief Sabilul Alif convened a meeting (pictured) between local authorities and the authors of the notice, originally drafted "in the interest of the majority of residents." The residential area is home to about 350 families, 20 of which are thought to be non-Muslims. The meeting ended with the cancellation of the notice, which included a provision requiring residents to bury their dead within 24 hours of their death in accordance with Islamic custom. The authorities did not release any statement explaining the controversial notice, issued days after the Indonesia Bethel Church (GBI) held a ceremony in the home of its members that caused protests from neighbours. "The draft notice existed but had not yet come into force. We will provide protection for every resident performing religious our other community activities,” said the Tangerang police chief. “Routine activities by non-Muslim communities are legal as long as they comply with the rules. Law enforcement and national values as defined by Pancasila and the 1945 Constitution are not negotiable,” he added.